Being a hero is an uncommon thing, let alone a super hero. 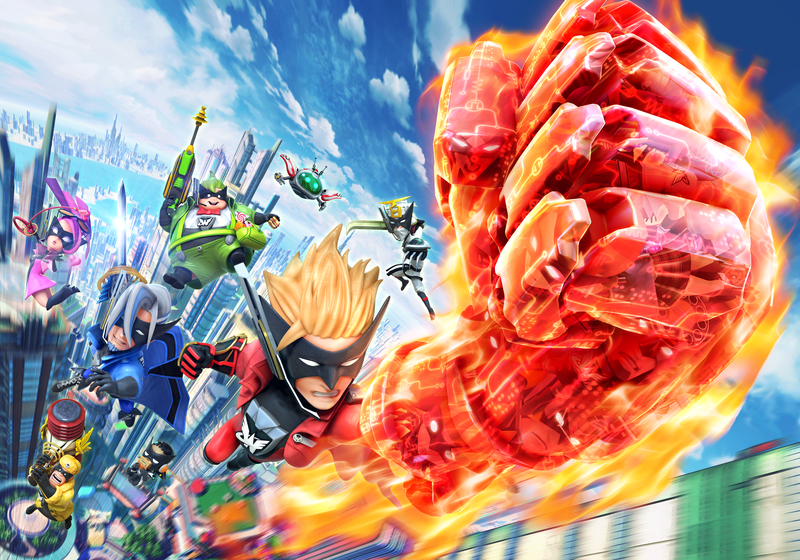 While we’re likely years of science away from consumer-oriented super powers, Platinum Games’ upcoming Wii U exclusive, The Wonderful 101 demonstrates the power of the common person and teamwork. That is, when lead by a super hero with the ability to create weapons out of people. This is a vibrant, chaotic, isometric adventure game that’s all over the place. The story follows a group of citizens who become the leaders of the “Wonderful 100” whenever things get dangerous. These color-coded leaders rally other citizens into their party and combine with them to form massive weapons, much like a weaponized cheerleader formation. These tools of justice are created by drawing simple lines such as an L-shape or a squiggle with the right analog stick or on the GamePad where longer lines equal more powerful weaponry. There was a story demo complete with goals and puzzles to solve, but my time was spent with the game’s five player co-op mode. I played with two other players and it was amazingly hectic. Each player controls their own posse denoted by color and gathers citizens to increase their power while defeating waves of bad guys. Should your party take a hit while you draw a formation, they’ll break apart and can be nabbed up by anyone, even your partners, by dashing through or drawing a circle around the dazed members. Everyone works together to fight the waves of increasingly tougher enemies, but there’s also some friendly score competition based on things like damage both inflicted and received. Despite the intuitive controls, The Wonderful 101 was immensely confusing initially, having not played the story demo. I button mashed my way through the first two missions, but as more varied enemies started to show up my weapon choice became more decisive. When facing armored enemies I drew up the whip to pull off the armor plating, and dealt with lots of smaller enemies with the sword’s broad strokes. I’d often supported my partners with the gun from afar, then quickly dispersed and switched to the fist to deal with new bad guys spawning closer to me. There’s a healthy mix of using the weapon you like, and bringing the proper weapon for the job. I also found two seemingly “special” weapons: a hammer which dealt massive damage after a windup, useful against bosses, and a bomb which did massive area damage but dispersed my party after use. There’s a lot of hitting the same button over and over in The Wonderful 101, which at first felt like a negative. On my second playthrough, however, I realized that rather than relying on complex combos or intricate maneuvers, the combat is more based on responding to the enemy types and positioning. The dodge, which assumes the form of a hopping slinky, is incredibly quick, giving you plenty of ability to respond to incoming threats. The Wonderful 101 is quick, the control scheme is smooth, and it’s got a goofy charm that can’t be resisted. This action game is all about playing, not so much mastering, and I was reluctant to end my time with it. The Wonderful 101 will be available only on Wii U on September 15, 2013 in North America and August 23, 2013 in Europe.